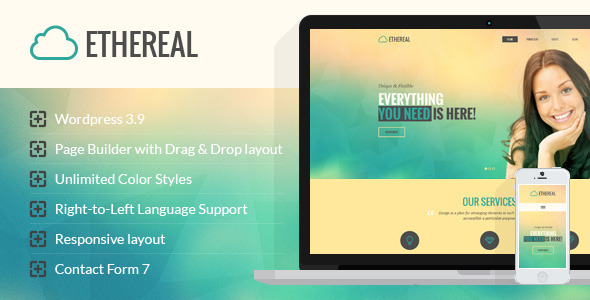 ETHEREAL is a clean and modern Multi Page WordPress theme. The theme uses the powerful Twitter’s Bootstrap 3 and takes advantage of its features: grid system, typography, elements and more. ETHEREAL is suitable for Freelancers, Agencies, Personal Portfolio, Creative Agency, Designer Portfolio, Illustrator Portfolio, Photographer Portfolio and more.Theme has a universal design, it thought every detail and animation effect. Its just as easy to customize to fit your needs, replace images and texts.